Some days, you can’t wait to get home and pour a nice glass of bourbon to celebrate a job well done. Other days, it’s a nice relaxing way to end a hard days work. But sometimes, sometimes you need that drink, to help you remember that the working day is over and to remind your self that your toils are not for naught. Now, dear reader, I hope that most of your days fall into the first category, with a few in the second. But when those third kind of days arise, that may well be why God gave us bourbon in the first place. Now Monday and Tuesday weren’t so bad, not really. Just the kind of days where little fires sprung up all day, and there never seems to be enough water to put them all out. Luckily for me, at days end I was in luck: I had brought a new bottle of bourbon into work to ask our staff photographer (and my good friend) Mike Tesh to take a picture of it for this website. Seeing as how it was days end, after all, I certainly saw no harm in sharing some of this new drink. I’m also lucky to work at a place with a few like minded individuals. 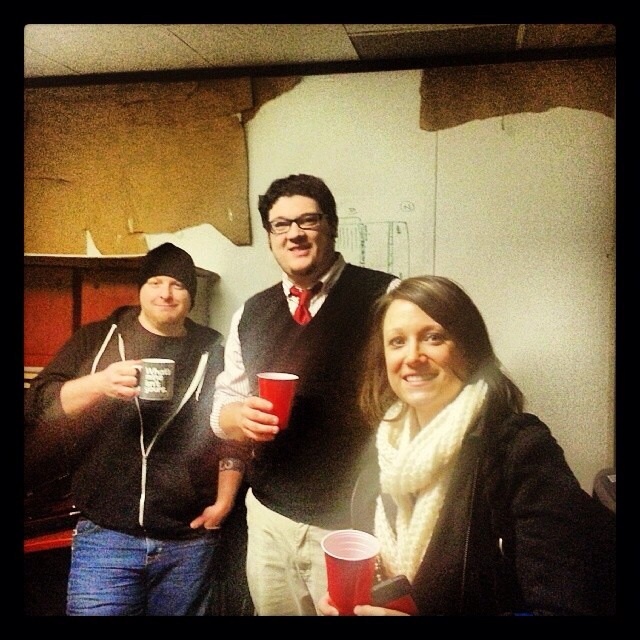 So without further ado, I also grabbed fellow bourbon enthusiast Josh McAllister and Katie Gleason to join us. Today’s bourbon of choice came to us from the New Holland Artisan Collection, a collection of which I have tried several different brandings already. Just a few weeks back I spoke to the fun of their Beer Barrel Bourbon, and I’m hoping to get a review posted in the next couple of weeks about one of my favorite whiskeys made by them, the Zeppelin Bend. 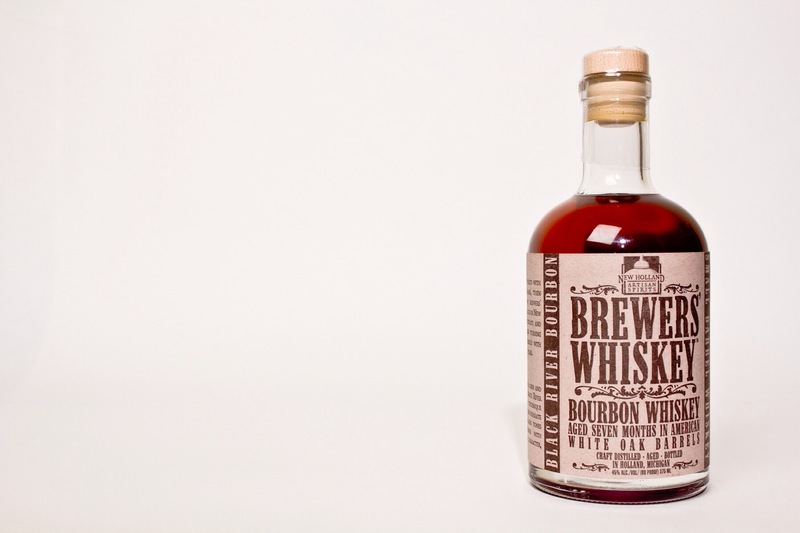 Today we tried the smaller batch Brewers Whiskey they have named Black River Bourbon. The Black River bourbon bottle states it was pot distilled and aged in new American oak, as all bourbon should be. From what I have read, it is my understanding that they barrel this whiskey in smaller barrels to accelerate the aging process. I may have my doubts about the successfulness of aging a bourbon more quickly by changing the barrel size. That said, we all poured a small glass, and went to work, albeit in a more utilitarian setting then I am accustomed to. Our take: if you have read this blog before, you know I have a pretty simple way of judging and rating Bourbons by my palate. First, I try all Bourbons straight. No ice, no mixing, just straight from the bottle to the glass. If a bourbon is impressive in a glass by itself, then it needs no mixing. My favorite Bourbons are all ones that could be had in a glass, neat. It needs proves to be harsh, or unimpressive, then I will add in a few chips of ice. There are certainly wonderful Bourbons that really don’t become themselves until there is a little ice added. Woodford Reserve, for instance, never tastes right to me without a few rocks in the glass. Woodford may not be my favorite bourbon, but it is certainly a good bourbon and a very nice pour. If those two methods haven’t given me enough to impress, I will try a bourbon in a mixed drink. A Manhattan, a whiskey sour, etc. Personally I rarely like mixed drinks, so that really is a last method of finding something I like about any particular bourbon. Again, there are fine Bourbons that go well in Manhattans that I wouldn’t necessarily drink straight or on the rocks. But if I had to mix you too enjoy you, you aren’t going to rate very high with me. Unfortunately, the Black River Bourbon falls somewhere between that second and third category. It’s nose was relatively unimpressive. There was the strong scent of corn, with an undercurrent of oak. I could pick out raisins, and some earthy tones, but mostly it was the corn and wood. The taste could only be described as young. The mouth feel was very thin, and as Josh had pointed out to me quickly, there was an emptiness of body. The predominant taste was that of Oakwood. There was a subtle hint of cigar box, some light nuttiness and a general burnt sugar that never grew into something greater, like molasses for brown sugar, but rather, stayed with a slight singed taste. The finish was mellow, and again the wood returned. There was nothing disagreeable, or unpleasant about this bourbon. Just unremarkable. As we drank our second set, we all agreed: there wasn’t much to say negative about this bourbon, there just wasn’t anything that positive to say either. Not all efforts are winners. Buffalo trace, four instance, takes big risks with their Single Oak Project, and their experimental bourbon line. If this is an effort that New Holland is using to refine their process, the good news is they’ve made a quality bourbon. It just isn’t anything special. Not yet anyway. Nice post and blog, I will be checking out some fellow bourbon writings. Well-written and thoughtful, I will use this as inspiration in my own Bourbon endeavors! Check out my blog about bourbon if you have a chance! Also, I would argue that changing even small things, like the barrel size, can measurably alter the final product. It may very well age it faster as the bourbon, by volume, is in more contact, by surface area, of the charred oak barrel. That doesn’t mean its perfectly predictable or controllable either, but it is for sure a variable.